Two brief notes in Library and Archives Canada’s holdings of the British Columbia Penitentiary illustrate the dangers of running prison work gangs in remote locations. At various points throughout its 102 years at the New Westminster site, the penitentiary operated a prison farm as well as carpentry, metal work and masonry shops. But in the early 20th century it attempted to establish an off-site logging and quarrying operation approximately 20 km from headquarters. 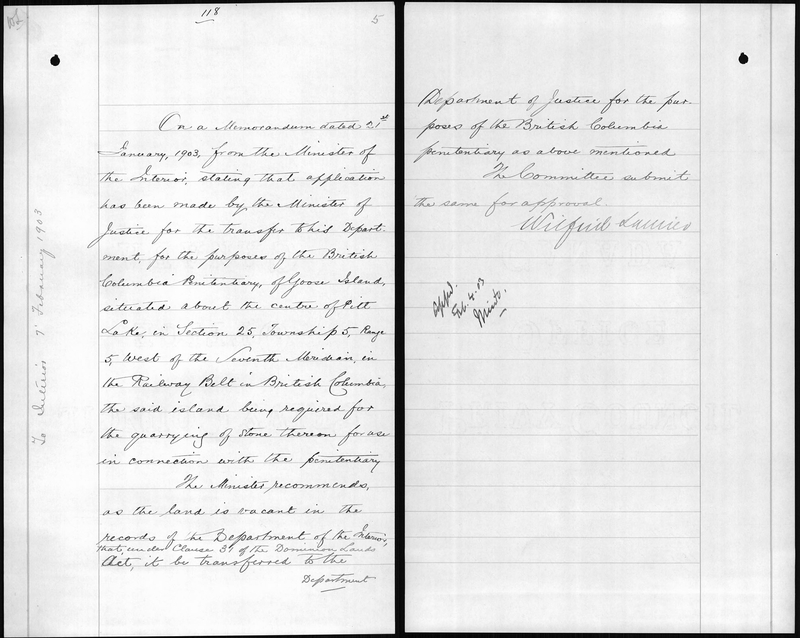 In 1903, the penitentiary acquired the deed to Goose Island through an Order in Council. Also known as Wright Island, Pen Island, and even Convict Island, this 140 acre property sits in the centre of Pitt Lake towards the eastern edge of B.C.’s Lower Mainland. The penitentiary’s plan was to set up a work camp on the island to extract its lumber and mineral resources, and in June 1906 two guards and seven convicts travelled to the island from the New Westminster site. The group, which was later joined by seven additional convicts, cleared roads, built log houses and a wharf, cut 200 cords of wood, and quarried 96.5 yards of granite. Additional crews were sent in the spring and summer of 1907 and 1908. As Goose Island was such a remote location at the time, prison guards were supplied with twelve carrier pigeons each week for communication purposes. One pigeon was sent from the island to the New Westminster site each day to provide a routine status report. 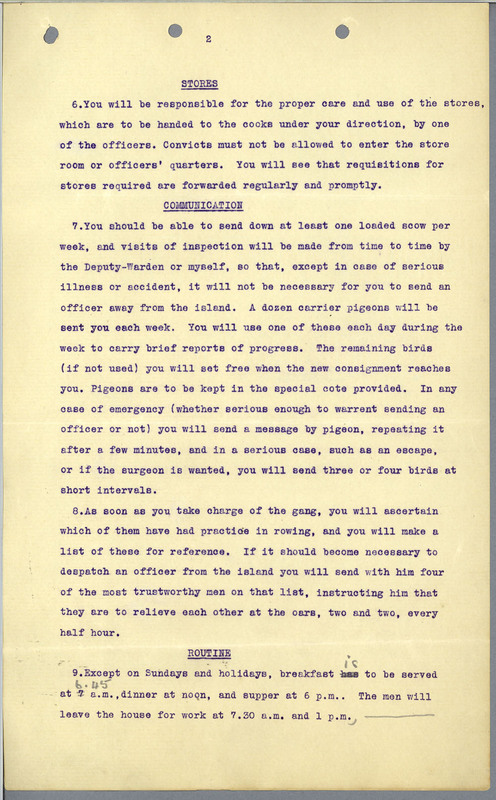 For urgent matters, guards were to send two pigeons in quick succession, and for emergencies such as escapes, three or four pigeons were to be sent at short intervals. On May 27, 1908 such an emergency was encountered at the camp. At 3:55 pm, guards sent the first of at least two carrier pigeons, which arrived at the penitentiary at 9:00 am the following morning to report a “murderous assault” by two inmates. A follow-up message indicating that the prisoners had been handcuffed and that no injuries were incurred was sent at 8:10 am on May 28th and arrived at 4:30 that afternoon. In addition to this attack, escapes and attempted escapes were also reported to have occurred from this camp. Predictably, the challenges of controlling a convict work gang in such a remote location led to the disuse of the island site. By 1919, the log cabins were in disrepair, and penitentiary staff erected “no trespassing” signs on the property to prevent vandalism. 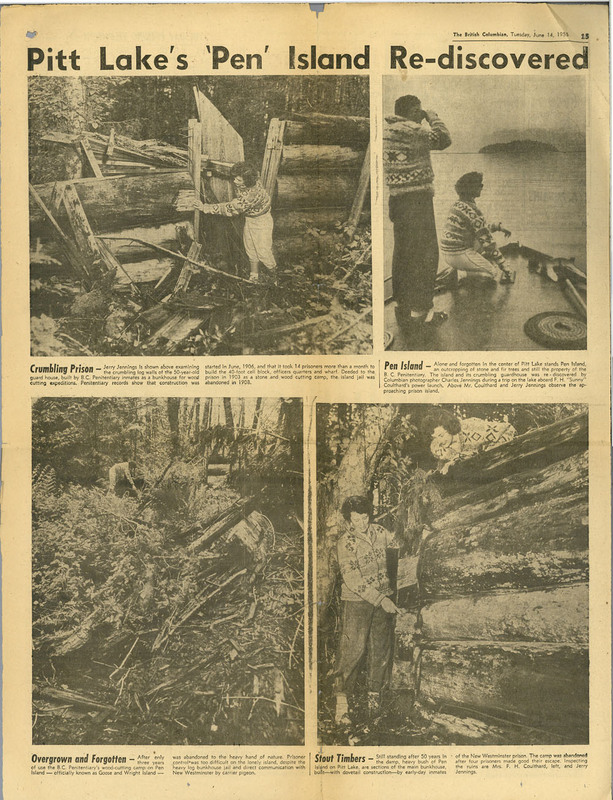 Despite some sporadic interest in the island’s stone, lumber, and recreational potential in the intervening years, little activity took place on the site before it was sold in 1953. 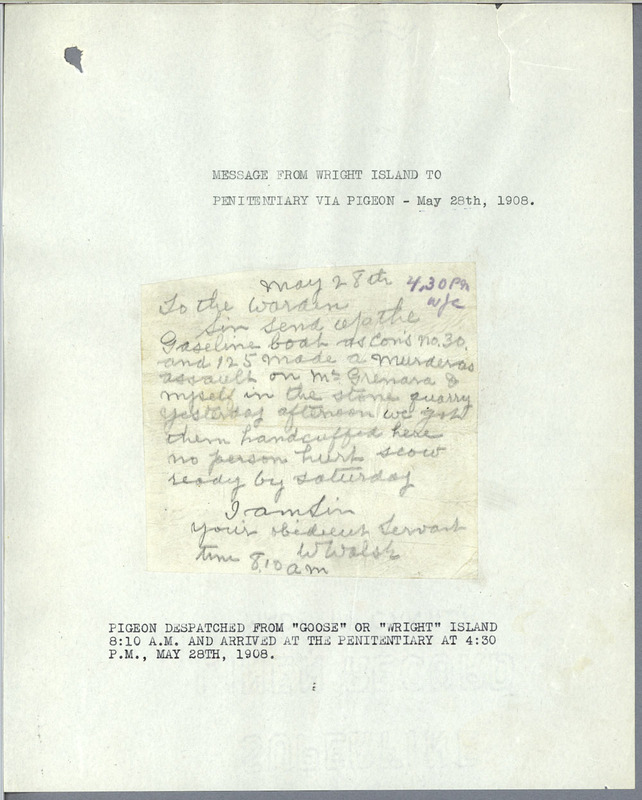 This entry was posted in Our Collection and Facilities and tagged British Columbia, carrier pigeons, Goose Island, penal system, work camp by Library and Archives Canada Blog. Bookmark the permalink. That would be this book? How reliable were the pigeons though? Were there instances where they just flew off onto their own? What made them go in the direction that the senders intended?